I’m Karen Gros, a culinary instructor, avid foodie and travel enthusiast. I teach cooking classes in our Provençal-style home in Eureka Springs, Arkansas, and lead small group tours to various regions in France. I get inspired when I travel and bring this inspiration back to my classes. Seeing the abundant produce at our local farmers’ market also feeds my inspiration. My husband is an organic vegetable farmer, so our commitment to locally produced ingredients runs deep. My passion is all about delicious food and feeling great. As Virginia Woolf quoted, “One cannot think well, love well, sleep well, if one has not dined well.” So let’s have fun creating delicious, savory meals at home “from scratch”. Cooking classes are held every month all year along (except June and July, when traveling in France) and I offer both a demonstration class (for those who like to sit & watch) and a hands-on class (for those who like to participate) once each month. I’ve been teaching cooking classes since 2004, and I have fun sharing and inspiring others, and often the learning goes both ways, as participants sometimes share their favorite ways to prepare a dish. The seasonally inspired menu changes every month. Locally grown and raised ingredients are my priority, and include traditional French classics, as well as menus artfully adapted to maximize health benefits (without sacrificing flavor). 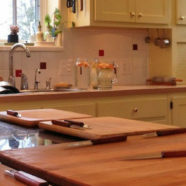 Learn to prepare homemade recipes using top quality, healthful ingredients.